Purohit Conveyor is quite aware of the modern day’s global demands with respect to systems standardisation. It has an elaborate quality assurance system in place. However, today's demands are not just in terms of quality of products but relate also to back up and developmental services provided by a vendor. Being a quality driven organization, we assure our range of products are flawless when they reach you. The quality control process at our end is started right from the procurement of raw material to the packaging and goes on till the final delivery of the product. Owing to our strict quality control measures and streamlined business activities, we have been able to gain certifications i.e. 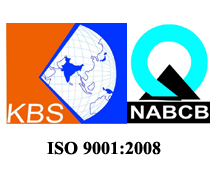 ISO 9001: 2008. Purohit Conveyor aspires to provide its clients with a wide range of indigenously developed quality products for the Industries its serving - comparable to the best available alternatives in the world. It aspires to continue with its Quality Control activities and fine tune the quality control processes specifically required by our standards. Detect and prevent non - conformance during manufacturing & implement the means to prevent its re-occurrence. Upgrade technology and improve techniques, systems & procedures and to carry innovations to meet the customers’ changing needs. Develop highly motivated and skilled human resources imbued with a strong sense of values and commitment to quality. Create a healthy working environment for the employees.